UGH! What's a girl to do when those basic boots are financially out of reach? The struggle is real. If you've ever stepped your foot inside the heavenly cloud of plush shearling lining, then you know that UGGs are a winter essential, even if you don't think they're cute. But these cozy shoe/slipper hybrids are notoriously expensive, and the classic styles and colors almost never go on sale. Luckily, the dedicated editors on the Brad's Deals team are experts in all things sale. Over the years, we've learned a few tips and tricks that can soften the otherwise hefty blow a pair of brand new UGGS will do to your wallet. Shop the best seasonal sales. Take advantage of credit card and coupon discounts on new styles. If you're looking for discounts on the new styles, you can find Neiman Marcus coupons a few times throughout autumn that will save you $50-$100 off the regular price purchase. The catch? You have to spend at least $200 to save, so plan on grabbing a pair for someone else in the family, too. Or, take advantage of an email signup or credit card offer. For instance, the Chase Sapphire Preferred card currently offers new cardholders 60,000 bonus points after spending $4,000 in the first three months, which can be worth as much as $1,100. Macy's offers 20 percent off your purchase when you open a store charge card, and you can get 10 percent off when you sign up for email and text alerts at Bloomingdale's. Note that some retailers may exclude UGG merchandise from these offers. Insider secret: UGG kids' boots look exactly the same as the women's styles and cost about 20 percent less. Kids' sizes 3-6 are equivalent to a women's size 5-8, so if you have feet on the smaller side, there's a good chance you'll find the perfect fit for a less threatening price. We also typically see deeper discounts on kids' styles when they go on sale. Buy Koolaburra by UGG (or a similar brand). The cheapest pair of UGG boots we found on sale this year were still $77. But UGG's sister brand, Koolaburra, features lookalikes for a fraction of the price. The Classic Mini starts at just $40, as opposed to its $135 sister. The difference? UGG boots are lined in 100% genuine sheepskin, while Koolaburra boots are lined with a combination of shearling and faux-fur. Considering you still get the soft suede upper and durable EVA sole, we think these boots are a bargain, even at full price. You can also buy select styles at Kohl's and take advantage of Kohl's Cash offers. Another option is to try another brand altogether. Bearpaw boots, which are nearly indistinguishable from UGGs and have a sheepskin and wool blend lining. You can get them for half the price of similar UGG styles, and they're also more likely to go on sale. Emu Australia boots are also comparable to UGGs in both quality and price — but we see deeper discounts on these throughout the year. Of all the options, we think Australia Luxe has the cutest styles, and they're having a sale! You can also find great discounts on this brand at Zulily. Get the right pair, and make them last. You'll want those new boots to last, so be sure to use a waterproofing spray. I personally love the Bailey button and bow style UGG boots, but I've also learned firsthand these aren't as durable because the shearling is exposed to the elements. If you live in a snowy climate, you're better off sticking with the classic styles (which are also cheaper). Also keep in mind, all UGGs are not created equal. While I find the classic UGGs to be instrumental in maintaining my personal happiness, the leather styles that look more like traditional boots do not breathe like the classics, and are not nearly as comfortable. If you're looking for a nice pair of riding boots, you can get a genuine leather pair for $60-$100 on sale from another brand. There's no need to spend upward of $200 on UGGs. Take advantage of Deal Alerts. 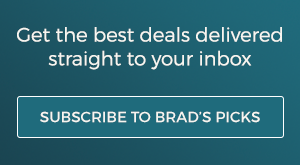 Let Brad's Deals do the deal hunting for you. When you create a deal alert for UGG, we'll send you a note whenever we find a matching deal. All you'll need to do is sit back and wait for the UGG deals to come to you! Are UGGs a staple in your wardrobe? Let us know in the comments.